Before you throw it into the wash or the trash, there is a lot to consider about the environmental impact of what you do with your clothing. Seriously. Just look at the lint catcher in your dryer after one load – all of that fabric cast off from your wardrobe. One study found that every load of laundry could release about 700,000 microplastic fibers into the environment. Some fabrics are worse than others – acrylic is worst, releasing five times more particles than polyester-cotton blends. The microfibers are released into air and water, pass through sewage treatment facilities, and then into rivers and oceans. A paper published in 2011 found that microfibers make up 85 percent of shoreline debris. Ecologists are finding plastic debris in animals and environmental samples – and they have become a component of our food supply and diet. In 2016, Sarah Dudas, a shellfish biologist with Vancouver Island University, planted thousands of clams and oysters with her students along the coast of British Columbia. NPR reported that after just three months they dissected samples and found plastic. Microfibers are affecting plant, animal, and human health. Dryers also have a huge carbon footprint. The amount of greenhouse gases emitted for just one load of laundry is significant. According to the National Resource Defense Council (NRDC), dryers are one of the last appliances to be innovated for energy efficiency. In an issue brief on the topic, NRDC notes a “typical electric clothes dryer sometimes consumes as much energy per year as a new energy efficient refrigerator, closes washer, and dish washer combined.” The brief purports that if residential dryers were updated to the most energy efficient models, consumers in the U.S. would save $4 billion each year. There are some things that can help! About 75 percent of the energy needed to do a load of laundry goes into heating the water. Using cold water saves energy and will save on your electric bill too. Using warm water causes dyes to break down and clothing to shrink, so using cold water means garments last longer. If you toss your towel into the laundry basket after every shower, it is time to rethink that habit. Many items are not “dirty” after they are worn just once, but family and culture habits may have trained you to launder after it has been worn. Of course, items like underwear or sweaty gym clothes do not need second-guessing, but many other items can be worn multiple times. The Cleaning Institute has some guidelines that can be helpful. You may like the fragrance added to your sheets, towels and clothes, but there is a good reason not to. 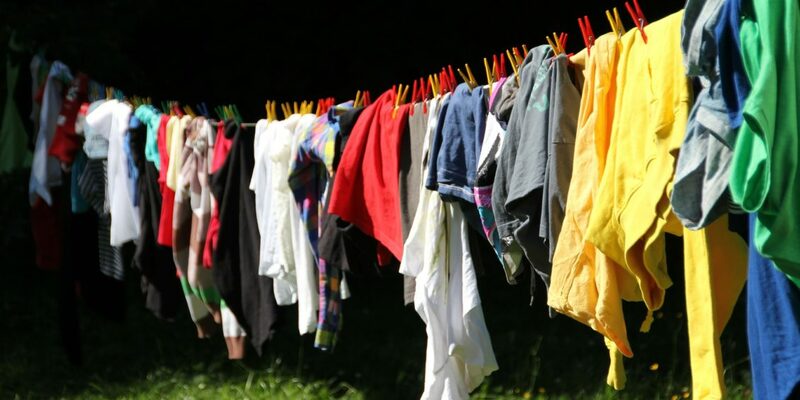 A journal article about a study from the University of Washington in the Air Quality, Atmosphere and Health noted that scented laundry liquids and dryer sheets contain hazardous chemicals, including two that are classified carcinogens. The National Institutes of Health also published a report “Dryer Vents: An Overlooked Source of Pollution?” that affirms the toxic pollutants and notes a few other health effects including eye irritation, skin reactions, headaches, and asthmatic reactions. Emissions from dryer vents are essentially unregulated and unmonitored, so there is really no safeguarding potential exposure. There are good reasons to line dry laundry too. It saves money and energy and is gentler on clothing, making them last and look good for longer. Line drying also reduces the fire risk that not only affects people, but the environment as well (FYI – Consumer Product Safety Commission estimates 15,500 fires each year from laundry dryers, costing close to $100,000,000). What to do when it is no longer wearable? Why throw away clothing when it can be repurposed?! Our landfills should not be the final destination for clothing and shoes. If something is in pretty good shape, a resale or consignment shop can give your shirt a new home while giving you some cash in your pocket. If you are looking for something that takes less effort, Goodwill Industries or Salvation Army are good options and they are in many communities throughout the United States. Your donations find a new home and the proceeds support job training, education, and other important supports for people in need. Even if something is ripped, soiled, or otherwise damaged, many clothing donation sites have a salvage program where they sell fabric for pennies per pound, again supporting important community programs. Bret Jaspers who conducted the NPR interview spoke of the huge benefit of donating. “One potential savings, carbon emissions – the EPA estimates that what we do donate each year, that 15 percent, is like taking over a million cars off the road.” We need to work on reducing the 85 percent that is currently not being repurposed and find a better way to reduce the environmental impact of our wardrobes. These are win-win ideas that just take a little time and intention. With climate change and predictions for big changes, we need to be doing everything possible to preserve and protect our planet. Take measures to reduce your laundry, energy consumption, emissions, and environmental impact by making informed choices.